Lunches can be expensive. Often we pop out for lunch intending to buy “just a sandwich” and before you know it, you’ve spent on average a fiver, and times that five times a week and before you know it you’ve spent £25 that week. This then adds up to £100 a month! Yikes! So then we try to bring lunch from home. We throw together two slices of bread with some ham in the middle, wrapped up some fruit you know you won’t eat, grabbed a bag of crisps and then dashed out the door. Hardly exciting is it? So how can your lunch more inviting to eat and have a litterless lunch? 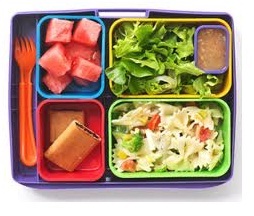 The answers are simply, bulk buy your food, plan your lunches in advance and invest in a good old fashioned lunch box with separate compartments. Before you roll your eyes and mutter under your breath, take a few minutes to read on. Buying in bulk is a great way to save money in the long run. Nipping into your local shop on the way home to buy a bag of salad which you will then forget about it also another way of having the costs going up. Fully stocking your fridge, freezer and cupboards mean you are less likely to spend money when you don’t really need to. Plan your lunches in advance so you can cook or prepare the night before. Always cook too much pasta? Have the leftovers for your lunch the next day. Pop a few slices of garlic bread in your lunchbox alongside some grated cheese and cooked mushrooms. And voila! A nice-looking meal for your lunch. Always popping down to the vending machine for munchies? Chop up your favourite fruit or veg, add some dip and away you go – happy, guilt-free munching. By sticking to the correct portion sizes in these boxes, you are less likely to create waste with the food you throw away. Any empty bags or packages from the kitchen can be reused for the future or recycled in your home recycling bins. You feel fuller and the environment is happier. It’s a win-win situation. The more people you encourage to do the same, the better.